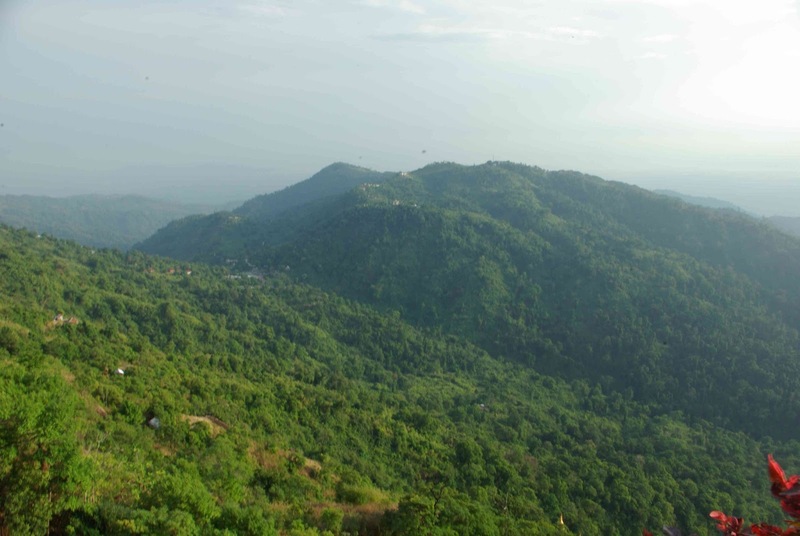 Between Bago and Kyaikto, the lovely rural scenery provided a continuous moving picture of farms, and fields, dotted with little towns and golden temples. 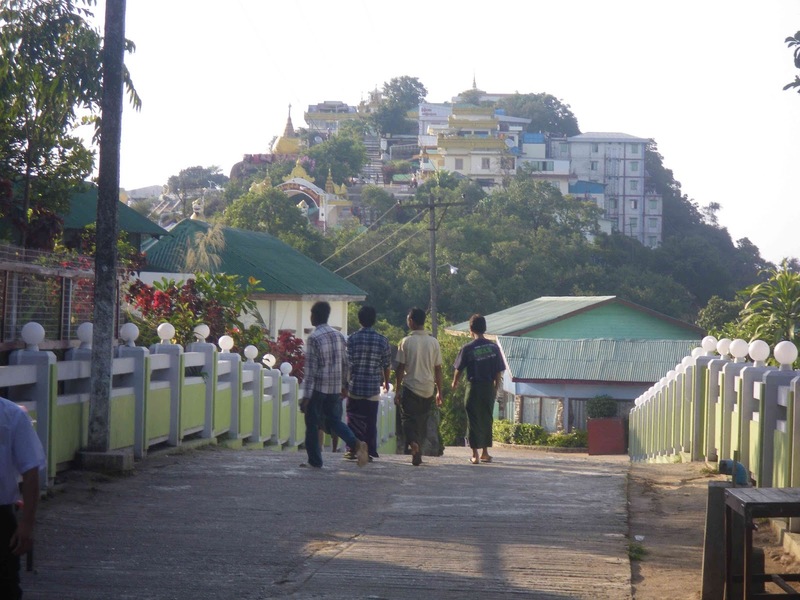 After passing through busy Kyaikto town, we took a left and it wasn’t far from there to the Kinpun bus station. It’s basically an overgrown carport with a few stalls and what I guess were the administration offices on either side of a large open area covered by a metal roof. Kyaw made sure we had all we needed for our overnight stay out of the car boot, as he talked with the drivers to check which truck we need to get on. 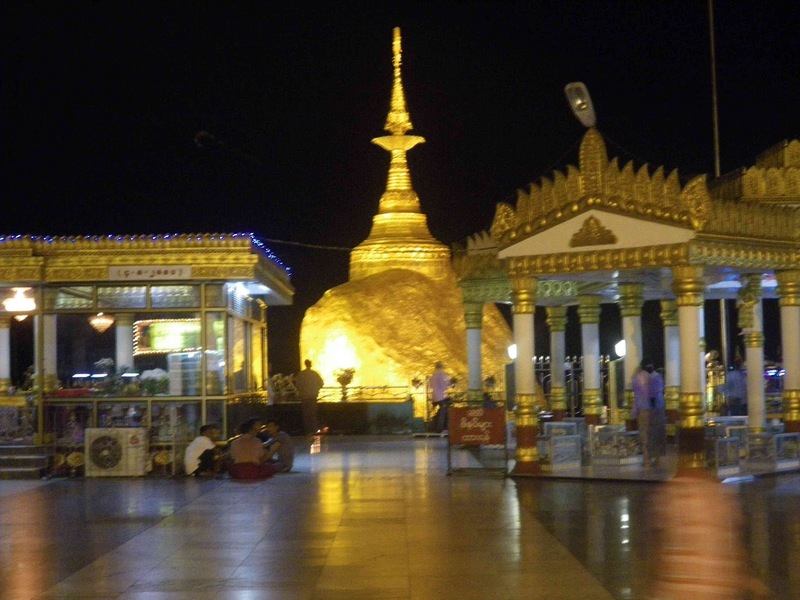 And how lucky we were to have Kyaw to check it all out for us. 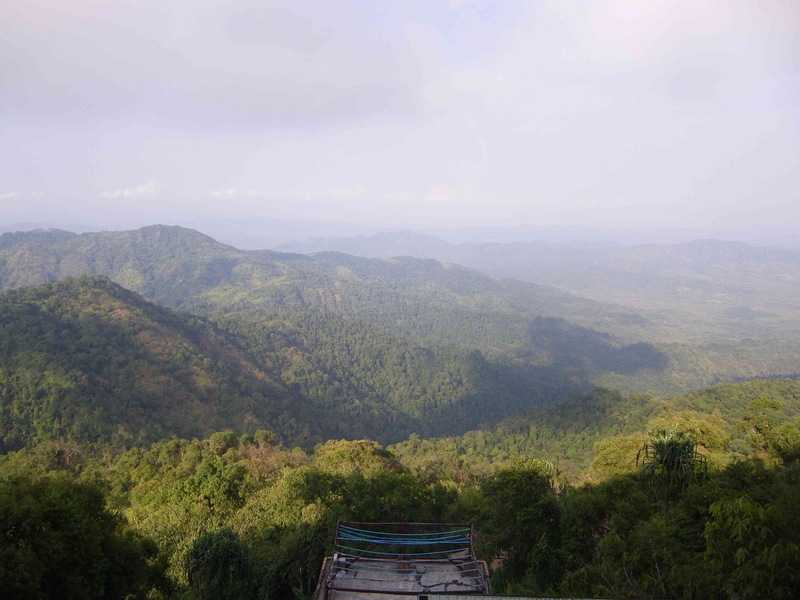 Turns out, there is the ‘regular’ truck which goes to the stop a little way from the top leaving travellers to walk (trudge) the last kilometre or so up the steep road to the top of Mount Kyaiktiyo. 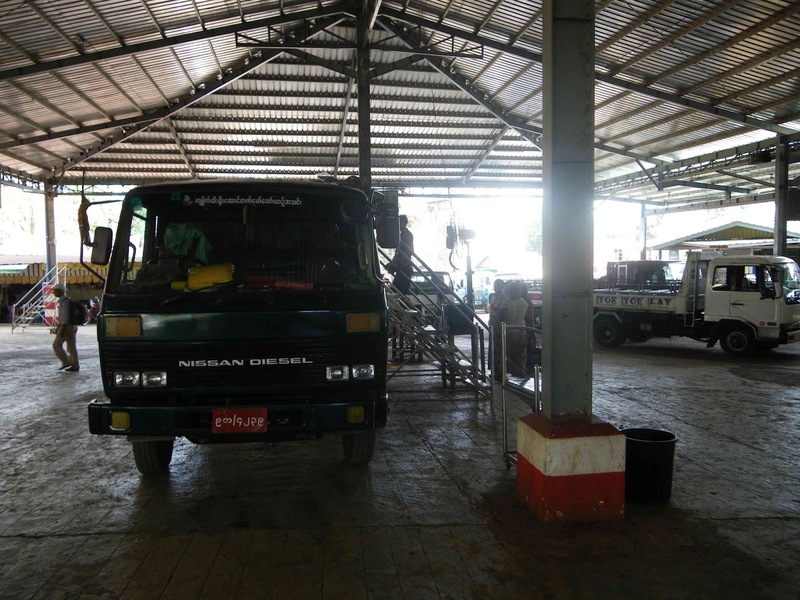 But there is a second truck – it looks the same as the regular truck – but instead of 1500 kyats, it’s 2500 per person, and it goes all the way (well pretty much) to the top thereby sparing you that hour of laborious walking in the heat, the sun, all that sweat, and pain – oh, did I say heat? Well worth an extra 1000 kyats! 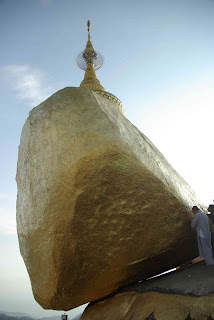 In fact, well worth 10,000 kyats! All we took with us were overnight bags (and my camera and tripod) trying to keep it to a minimum. Kyaw assured us he’d be waiting tomorrow morning around 9 or 10am for the truck to bring us back down, and we bade him farewell. 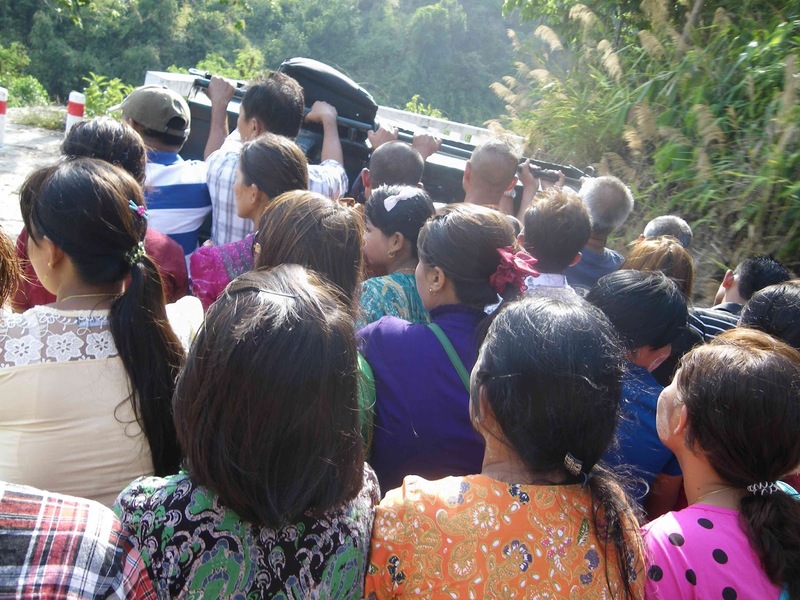 We walked over to a small truck that had its cargo area transformed to carry people. Planks of wood had been positioned across the tray to form seats for passengers. Beside the truck were small metal stair-ways wheeled into place to allow travellers to climb on and off. The truck that Kyaw told us to get on was already pretty much crowded full. But apparently not. Some exchanges took place between the driver and the truck organiser before the locals squished up enough to allow our two western bums to squeeze on. Actually, it was a bit funny. You didn’t need to understand the local language to understand what was going on. As we stepped up the stairs, the others already crammed in on the truck took one look at us, with a backpack each and my large camera bag, and said “Really? We have to make room for their large western backsides?” (Not that J or I are particularly large, but in comparison to local Myanmar people, we were a lot taller and wider.) 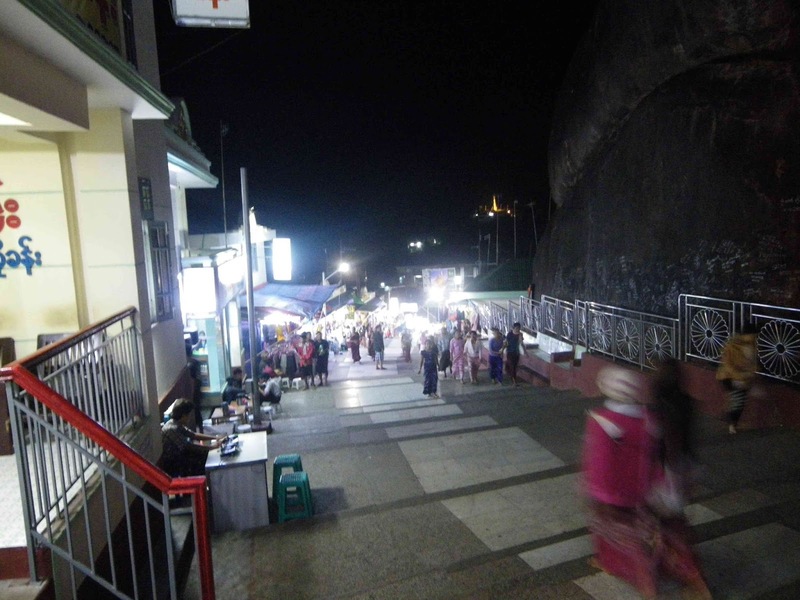 The truck driver said “Yes – it’s kyats for me and my family – there’s plenty of room – move over”. Faces looked uncertain. Local chatter. A few giggles and exclamations. And magically two small spaces appeared, and then J and I squashed and “sorry-ed” our way onto those planks. We sat for a few minutes, waiting uncomfortably, before we finally set off. The first few hundred metres are flat and OK. Then it started. Very quickly, the truck tilted and lurched up the mountain. Countless potholes ensured a bumpy ride. Coupled with some sharp bends and steep inclines, with short downhill patches, the ride was not dissimilar to a rollercoaster ride. I was positioned hard up against truck’s side, holding on tight to keep from being jolted over the edge. J had his video camera out trying to capture the action on the rear-most plank. After each big bounce, or acute corner, all us passengers looked around and laughed together, sharing the terror – or thrill – probably a combination of both. Along the way up, we stopped twice. Once at what I think was a local temple where a spruiker stood on a ladder to address the group that resulted in a few kyats being placed into a hat (and I mean like a baseball cap), presumable donations. 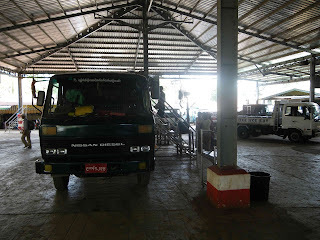 The second stop was at the regular truck stop where most trucks stop and where our driver collected the 2500 kyats fare. From there, it wasn’t too much further to the top. But holy, moley! I sure would not like to hike up that hill! The road was maybe a little steeper, and more pothole-ier. At a few points, we caught a glimpse of the Golden Rock building our anticipation. Feeling hot and bothered in the relative comfort of the packed truck, I couldn't help but feel for the few groups we passed slowly plodding up the hill. Arriving at the top stop, we clambered off to walk the last two hundred metres to our hotel for the night – the Mountain Top. A few stalls lined the road along the way but we were too focused on getting to our room to stop and look. “Mingalabar. Are you Ms K and Mr J? 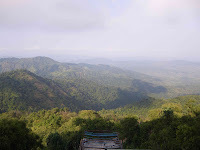 Welcome to Mountain Top Hotel”. All our arrangements had been made by our wonderful agent, One Stop Myanmar, and we were in our room only a minute after we arrived. Up here, the air temperature was much cooler, which was a welcome relief. The view from our room’s window was beautiful. Time to freshen up, relax a little while, prepare the camera and tripod, before heading to the revered rock. The tourist checkpoint was only a few hundred metres up from the hotel. Handing over our entrance fee of US $10 in exchange for green paper passes hanging on a thin rope ‘lanyard’, we set off towards the terraced platform of the rock temple. Where the concrete path stopped we removed our thongs (flip-flops for those readers who aren’t familiar with the Aussie term for the common rubber footwear) and carried them with us as we climbed the tiled stairs up. Along the way were a few terrace lookouts offering views over the valley and next mountain range and distant river beyond. Amongst the trees on the opposite hillside, there were other small temples with gold spires shining in the late afternoon sun. 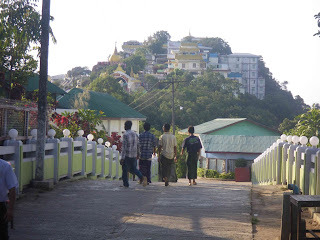 Stairs led up the hill to a tiled open square where there were many groups of people, monks, nuns, families, children playing and running around creating a real community atmosphere. 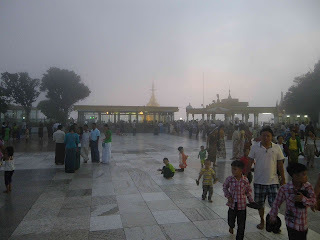 Much like Shwe Dagon paya in Yangon, the mood was joyous and happy, but also reverent with many individuals, alone and in groups, praying, chanting and meditating. The great gold rock was simply awe inspiring. Larger than life, it glowed under the late afternoon sun. Hundreds of bells provided a soundtrack to the temple. Worshippers purchased them and placed them on the make-shift alters that surround the rock, where incense burned beside glowing candles. 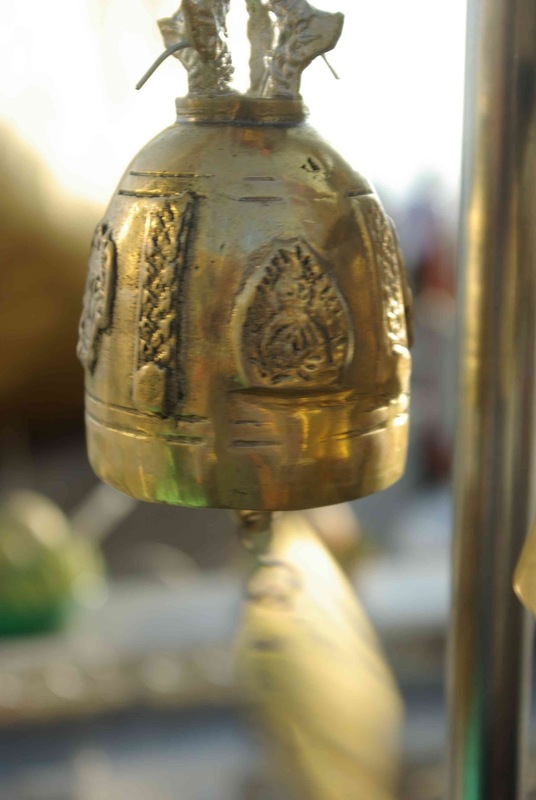 Attached to the bells’ clangers, hanging off the bottom were golden leaf-like disks where peoples’ hopes and prayers had been hand written before offered up. 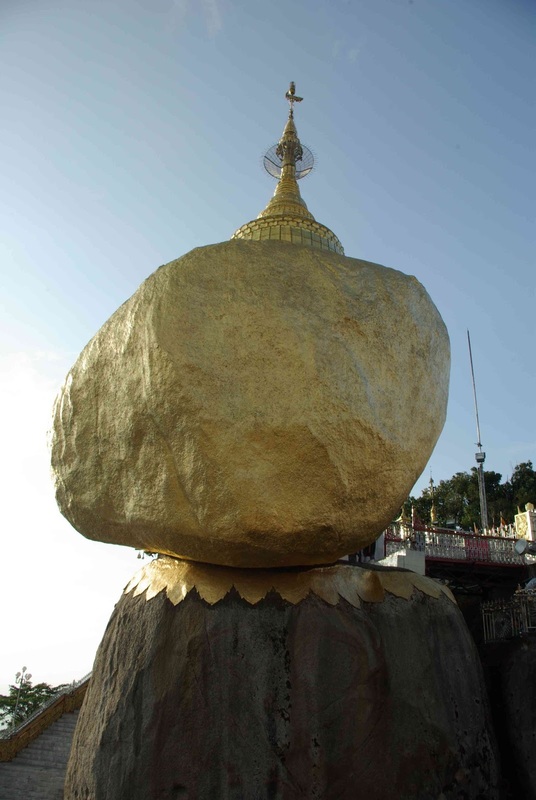 On a special platform beside the magnificent gold rock, men and boys could attach paper-like gold leaf of offering to honour the precious teachings and make merit for a better rebirth. Unfortunately, females can not get as close and need to be content with seeing it from a few metres away. There is a spot on the viewing platform where you can see just how precariously the rock sits on the side of the mountain. 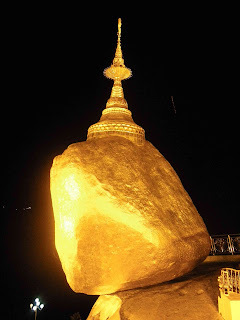 Literally, it is only prevented from rolling down the mountain by a foot or two where the rock connects with the solid ground of the hillside, which in actual fact is another large rock embedded into the mountain. J and I walked around all the various viewing terraces that offer many views of the rock, as well as the stunning vista over the surrounding valley. As the sun sunk into the countryside in the distance, we chose a spot to sit and simply absorb the scene, the mood, the sense of importance. Throughout our day, we shared many smiles and “Mingalabars” with local people, as well as inclusions in their photos. 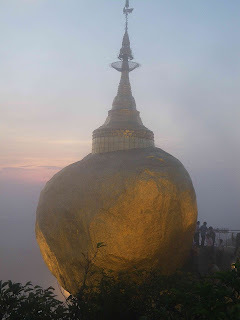 Watching the sun set, the sky changing colours, surrounded by pilgrims, the sound of melodic mantras rising all around, and the rock shining under numerous spotlights, was a incredibly special moment that will never leave me. But the visit didn’t stop there. 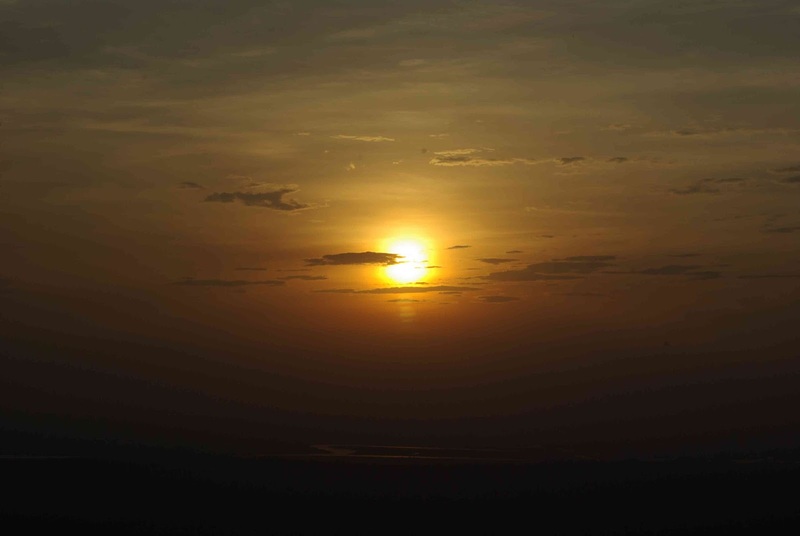 Once the sun had disappeared behind the horizon, clouds of fog rose up from the valley floor. The atmosphere become even more surreal and the temperature dropped dramatically. We returned to the Mountain Top hotel to refresh and have dinner. Once again, we found the local food delicate and delicious. Not to mention the amazing tofu chips we had for entrée. Similar to ‘prawn crackers’ served in many Asian restaurants anywhere in the world, they were light and crispy and I absolutely loved them. Totally my new favourite food discovery. From where we were sitting, we could see the rock glowing in the distance from the restaurant window. It was only 7:30pm or so and we looked at each other after we finished our meal and thought, “Now what?” I suggested that if the rock wasn’t closed, we could go check it out by moon light. On our way back to the room, I asked the reception staff what time the pagoda closed. At first they weren’t sure what I was asking, and then realised that I thought we couldn’t go back. “It no close – you can go – very nice light” our smiling assistant informed me. Great! Grabbing our passes, we headed back up the stairs in the cool evening air where some fog was still blowing around the peak. The mood was more sombre. Candles lit up the faces of local worshippers sitting in groups near the sacred rock. Bells chimed softly in the gentle breeze. Fragrant incense smoke wafted from all the offering places. It was quiet, peaceful, almost tranquil, with much fewer people about. The rock itself positively glowed. All around, the hushed prayers and mantras of the faithful provided a different, more subtle feeling than earlier that same afternoon. Around the terrace, which is quite a large area, neon lights lit up images of dragons, Buddhas, and other religious objects. A group of monks (out way past their bedtimes I thought) were so amused seeing tourists out at night, and quickly grabbed me into their happy-snaps. Many more local people said their tentative “hellos” as we walked around, with so lots more lovely exchanges, photos, and many, many more “Mingalabars” and smiles. 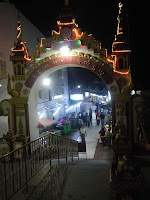 Over to one side, there was a gateway of sorts with steps leading down to a little strip of shops. J and I looked at each other and thought “Why not?” The smell of fresh rice pancakes met us as we approached the row of stalls. I think the locals thought we were lost, as they seemed to be amused by our presence. A few big smiles and “Mingalabars” fixed that, and soon we were chatting to some young Myanmar people about Australia and the weather and how far we had come. They seemed to think it amazing we would come all that way to see their rock! Then I spotted something which I couldn’t quite believe. Something I can see now as I write in my lounge room. Something that poor J couldn’t believe I purchased. And let me just say, the local girl I bought it from thought was unbelievable that bought it. It was (is) a snow dome. You know the ones – a glass/plastic half-globe with the local scene in the centre and a water filled environment filled with glitter that looks like snow when you shake it up. Well – there it was. 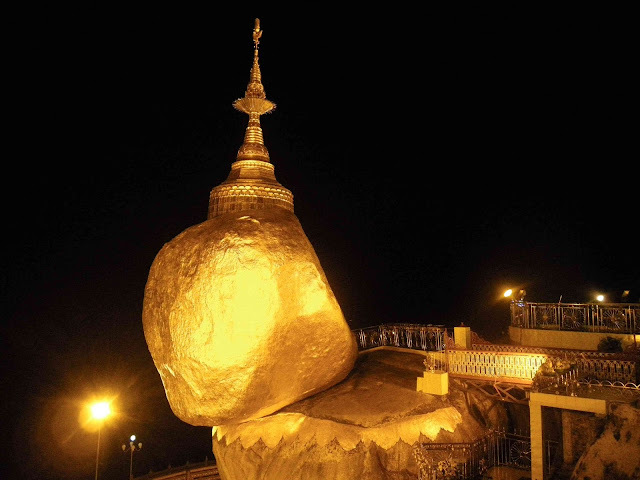 The Golden Rock with gold glitter and gold pebbles that rained down over it when I turned it upside-down. AND! And not only that, it had lights in the base that illuminated the scene and changed colour from blue to green to yellow to orange to red and purple back to green. And also flashed at different times and speeds. How much I hear you ask for this special memento? All of 1000 kyats. Ok. I know. But no worse than the stalls selling toy guns and other random games. We walked through the little town on the other non-tourist side of the mountain, attracting a little friendly attention. Mostly surprise. Overall, we felt welcomed, being offered local food (which I was dubious about as it had been sitting out all day), and drinks. We also browsed the stalls helping out a local buyer choose what colour tee-shirt to buy via a series of smiles and thumbs-up. Children thought we were some sort of freaks and laughed at us before saying “hello”. A group of young monks were gathered at one stall so I rushed over to see what they were buying. Key rings. Just what a monk may need. Most Myanmar men are monks for at least one (or two) period(s) of their lives, for as little as a month, or long as – well all their lives. I guessed these guys were only short term ordained-ees. After a good hour or so, we returned to the hotel. It was still early so decided to have a night cap before bed. Of all the places you’d expect to find Australian red or white wine, this is not one of them. But the Mountain Top hotel has many international wines on its wine list. I decided on a local wine though, as we reflected on the superb evening we had. This night was one of the highlights of our trip. The people, the warmth, the feeling that we were part of something special. It’s these types of experiences that drives me to travel – not just the places, but the people and interactions. It will stay with me as one of my most memorable travel experiences.